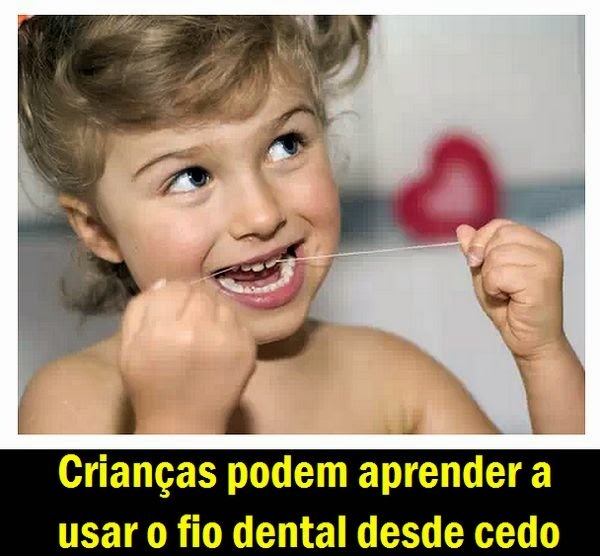 O fio dental deve ser introduzido na rotina da criança assim que os dentes começarem a nascer. “Primeiramente a limpeza com o fio dental pode ser feita uma vez ao dia, obviamente realizada pelos pais. Isso fará com que a criança sempre o encare como algo natural, assim como tomar banho e pentear os cabelos”, afirma Renata Centenaro, cirurgiã-dentista idealizadora do projeto infantil Turminha do Sorriso que leva saúde bucal às escolas. Para a especialista, o interessante é deixar o interesse da criança vir com naturalidade. “Com o passar do tempo ela vai ter curiosidade e pedirá um pedaço do fio dental na mão”. O exemplo também é super importante. A criança acaba por ser motivada ao ver seus pais usando o fio dental. “É a mesma coisa que tentar forçar o filho a comer uma fruta, se a criança só vê os pais comendo doces. Exemplo e rotina farão o hábito se estabelecer naturalmente”, diz a especialista. Apesar de as crianças serem capazes de aprender a usar o fio dental bem pequenas, antes dos seis anos de idade, essa prática não pode ser feita sem a supervisão de um adulto. “É importante que o adulto faça a higiene da criança e ao mesmo tempo estimule o hábito. Assim, ela vai se sentir motivada a treinar a coordenação motora para conseguir passar corretamente e, com a persistência, passará melhor que as crianças da mesma idade que não treinam diariamente”, afirma Renata. É importante ressaltar que é normal que antes dos seis anos de idade a criança ainda não passe o fio dental e nem escove os dentes com perfeição. “Nessa fase, a higiene adequada é tarefa dos pais”, diz. Para que o aprendizado seja ainda mais fácil, Renata acredita que tentar tornar o momento da higiene bucal prazeroso é o melhor caminho. Portanto canções e brincadeira são super bem vindos nessa hora. Além disso, nessa idade as crianças são muito receptivas ao que é “certo” por terem necessidade de aceitação e aprovação. “Elas querem ser elogiadas e aceitas. Diga-lhe que algo faz bem e que é certo de forma agradável e prazerosa e ela vai se esmerar em fazer. E é possível explicar-lhe numa linguagem adequada ao seu entendimento que passar fio dental vai limpar o espaço entre os dentes, onde a escova não entra, e ela vai entender perfeitamente”, diz a dentista. and management of sleep-disordered breathing problems. Identify the role of orthodontics in obstructive sleep apnea (OSA). Define the role of orthodontics in the diagnosis of OSA. Recognize the role of orthodontics in airway imaging relative to OSA. Identifying extraoral and intraoral characteristics of patients with suspected OSA. Recognize the role of oral appliances in the treatment of OSA. What is the role of orthodontics in obstructive sleep apnea (OSA)? Orthodontics is the art and science of three-dimensional diagnosis and management of 1) dental, 2) skeletal, and/or 3) soft tissue structures of the craniofacial system. Components of diagnosis include documentation of dental, skeletal, and soft tissue relationships relative to one another and to the chief complaint of the patient. Included in this diagnostic work-up is the documentation of posterior airway architecture, including transverse and vertical dimensions of the palatal vault and oropharyngeal areas. This inclusive diagnostic protocol is intended to use orthodontic “gold standards of diagnosis” and to appropriately identify how dentoskeletal and soft tissue findings may correlate with other systemic disorders such as OSA, often overlooked in initial examinations. What is the role of orthodontics in the diagnosis of OSA? What is the role of orthodontics in airway imaging relative to OSA? What are identifying characteristics of patients with suspected OSA? How are treatment decisions made regarding OSA? What is the role of oral appliances in the treatment of OSA? Have guidelines been established regarding the use of oral appliances, and is there evidence for their efficacy in general? Cephalometric analyses are based on superimposition of the left and right sides at mid-sagittal plane, but precise superimposition is difficult to achieve since facial symmetry is infrequent. Manual data collection and processing (manual and digital representation of physical landmarks) in cephalometric analysis have been shown to be less precise than three-dimensional imaging techniques. As a result of this imaging improvement, the orthodontist is now able to evaluate not only dental, skeletal and soft tissue structures in a three-dimensional (x – y – z) dimension, but also capable of evaluating the integrity of these structures relative to their pitch (coronal or anterior-posterior dimension), yaw (transverse or horizontal dimension), and roll (vertical or sagittal dimension) (Figure 2). Thus a “true 3 x 3 dimensional analysis” allows the orthodontist to more accurately diagnose dental, skeletal, soft tissue, AND upper airway dimensions as needed (Figures 3A-3B). What are identifying extraoral and intraoral characteristics of patients with suspected OSA? Given the physical signs and subjective symptomatology common to OSA, it is apparent that a very thorough extraoral and intraoral craniofacial examination be conducted as part of the orthodontist’s diagnostic due diligence to their patients. Management of OSA is a multi-disciplinary effort utilizing a number of treatment modalities such as CPAP (continuous positive airway pressure – nasal or oral); behavior modification (dietary modifications, smoking cessation, weight loss, and exercise, for example); MME (maxillomandibular surgical expansion/advancement); and oral appliances. The “gold standard” for reliably and accurately diagnosing OSA is polysomnography (sleep study – PSG) conducted either in medical facilities such as “Sleep Centers” or a home study utilizing a portable polysomnography unit. Data collection includes electroencephalogram (EEG) activity to measure and record brain wave activity, electromyography (EMG) to record muscle movements associated with restless leg movements and sleep bruxing, electrooculogram (EOG) to record eye movements during REM-NonREM transitions during sleep, electrocardiogram (ECG) to record heart rate, nasal air flow sensors, and audio microphones to record frequency and duration of snoring.15 The physician ordering the PSG interprets the data collected, and treatment recommendations are made according to the severity of the problem, most often using the “gold standard” of Apnea-Hypopnea Index (AHI) and blood oxygen saturation. Sometimes, Respiratory Disturbance Index (RDI) is used to classify OSA, but this may be somewhat confusing since it includes data other than AHI, resulting in the RDI being greater than the standard AHI. By definition, apnea is the complete cessation of airflow for at least 10 seconds, and these can be classified as obstructive, central, or mixed based on whether effort to breathe is present during the event. Hypopnea is defined as a reduction in airflow that is followed by an arousal from sleep or a decrease in oxy-hemoglobin saturation21. What is the role of oral appliances in the treatment of OSA? Have guidelines been established regarding the use of oral appliances, and is their evidence for their efficacy in general? Orthodontics is recognized as being a key player in the multidisciplinary, evidence-based approach to diagnosis and management of sleep-disordered breathing problems …. Recently, a collaboration between the American Academy of Sleep Medicine and the American Academy of Dental Sleep Medicine resulted in the publication of Clinical Practice Guideline for the Treatment of Obstructive Sleep Apnea and Snoring with Oral Appliance Therapy: An Update for 2015 – An American Academy of Sleep Medicine and American Academy of Dental Sleep Medicine Clinical Practice Guideline. These guidelines include recommendations for the use of oral appliance therapy in the treatment of OSA and snoring, and are internally graded as to their strength of recommendation, quality of evidence and benefits versus harms/burdens assessment. These guidelines represent the best effort to date to identify for whom and how these appliances should be implemented for the treatment of OSA and snoring. As a supplement to the listed guidelines and recommendations, the AADSM published a list of Functional Expectations of Oral Appliances in 2014 with emphasis placed upon the limitations of these appliances and the specifications for their fabrication and use. OAs are fabricated to protrude and help stabilize the mandible in order to maintain a patent upper airway during sleep. An OA is custom fabricated using digital or physical impressions and models of an individual patient’s oral structures. An effective OA is NOT a prefabricated item that is trimmed, bent, relined, or otherwise modified. An OA is made of biocompatible materials and engages BOTH the maxillary and mandibular arches. OAs allow the mandible to be advanced in increments of < 1 mm with protrusive adjustment range of 5 mm. Any reversal of the mandibular advancement must be possible. OAs are suitable for placement and removal by the patient or caregiver. OAs maintain their structural integrity over a minimum of 3 years. These expectations and limitations were developed as a means of establishing some sense of evidence-based uniformity in the fabrication and use of oral appliances with OSA patients for dental generalists and specialists. Orthodontic diagnosis is a three-dimensional exercise in data collection including advanced CBCT imaging and digitally scanned models that help provide the orthodontist with cutting edge information about their patients. In the past, orthodontic diagnosis consisted of data specific for dental, skeletal, and soft tissue structures and relationships. However, current standards for diagnosis and treatment may now include airway architecture analysis, diagnosis of sleep-disordered breathing and management strategies for OSA diagnosed in pediatric and adult patient populations alike. Orthodontics is recognized as being a key player in the multidisciplinary, evidence-based approach to diagnosis and management of sleep-disordered breathing problems and how these problems relate to the growth, development, health, and well-being of our orthodontic patients. John W. Stockstill, DDS, MS, is a Professor — Orthodontics Temporomandibular Disorders/Orofacial Pain at Seton Hill University Center for Orthodontics in Greensburg, Pennsylvania. He is also a Diplomate of the American Board of Orthodontics. Neidle E. On the brink — will dental education be ready for the future? J Dent Educ. 1990;54(9):564-566. Klasser, G and Balasubramaniam, R. Sleep Bruxism: What Orthodontists Need to Know? In Kandasamy S, Greene, CS, Rinchuse DJ, Stockstill JW, eds. TMD and Orthodontics – A Clinical Guide for the Orthodontist. Switzerland:Springer International Publishing;2015:63-79. McNicholas WT. Diagnosis of Obstructive Sleep Apnea in Adults. Proc Am Thorac Soc. 2008;5(2):154-160. Lumeng JC, Chervin RD. Epidemiology of pediatric obstructive sleep apnea. Proc Am Thorac Soc. 2008;5(2):242-252. Ivanhoe, JR, Lefebvre CA, Stockstill JW. Sleep disordered breathing in infants and children: a review of the literature. Pediatr Dent.2007;29(3):193-200. Proffit WR, Fields HW, Sarver DM. Contemporary Orthodontics. 5th edition. St. Louis, MO:Mosby, 2012. Standring S (ed.). Gray’s Anatomy: The Anatomical Basis of Clinical Practice. 40th ed. London:Churchill Livingstone;2008. Guilleminault C, Akhtar F. Pediatric sleep-disordered breathing: New evidence on its development. Sleep Med Rev. 2015;24:46-56. Athanasiou AE. Orthodontic cephalometry. London: Mosby-Wolfe;1997:241–292. Nalçaci R, Oztürk F, Sökücü O. A comparison of two-dimensional radiography and three-dimensional computed tomography in angular cephalometric measurements. Dentomaxillofac Radiol. 2010;39(2):100–106. Karatas OH, Toy E. Three-dimensional imaging techniques: A literature review. Eur J Dent. 2014;8(1):132-140. Johnson JM, Moonis G, Green GE, Carmody R, Burbank HN. Syndromes of the first and second branchial arches, part 1: embryology and characteristic defects. AJNR. 2011;32(1):14-19. Johnson JM, Moonis G, Green GE, Carmody R, Burbank HN. Syndromes of the first and second branchial arches, part 2: syndromes. AJNR. 2011;32(2):230-237. Graber L, Vanarsdall R, Vig K. Orthodontics, 5th Edition. Philadelphia, PA:Mosby, 2012. National Institutes of Health – National Heart, Lung and Blood Institute – 2012. Epstein LJ, Kristo D, Strollo PJ Jr, Friedman N, Malhotra A, Patil SP, Ramar K, Rogers R, Schwab RJ, Weaver EM, Weinstein MD; Adult Obstructive Sleep Apnea Task Force of the American Academy of Sleep Medicine. Clinical guideline for the evaluation, management and long-term care of obstructive sleep apnea in adults. J Clin Sleep Med. 2009;5(3):263-276. Division of Sleep Medicine – Harvard Medical School, 2011. Lazard DS, Blumen M, Lévy P, Chauvin P, Fragny D, Buchet I, Chabolle F. The tongue-retaining device: efficacy and side effects in obstructive sleep apnea syndrome. J Clin Sleep Med. 2009;5(5):431-438. Ramar K, Dort LC, Katz SG, Lettieri CJ, Harrod CG, Thomas SM, Chervin RD. Clinical practice guideline for the treatment of obstructive sleep apnea and snoring with oral appliance therapy: an update for 2015. J Clin Sleep Med. 2015;11(7):773-827. Punjabi NM. The epidemiology of adult obstructive sleep apnea. Proc Am Thorac Soc. 2008;5(2):136-143. Sabe o que acontece quando perde um dente? Entenda como a recessão (ou retração) das gengivas acontece. Doutor, meu menor range muito os dentes à noite. Será stress? Olha, possivelmente sua respiração noturna é deficiente. Olha, na grande maioria das vezes, nas crianças com bruxismo, há uma hipertrofia das amígdalas e a respiração torna- se deficiente. Assim como uma possível mandíbula retruída e cavidade oral reduzida. Há com isso uma redução da oxigenação sanguínea. Faltando oxigênio o cérebro envia impulsos aos músculos da mandíbulas e ai… isso acontece. Assim não é tanto por um stress infantil. Um otorrino nos irá ajudar. Que bom saber disso, vou agendar uma consulta com o médico. Uma boa notícia que iremos corrigir isso bem cedo. O otorrino será nosso paceiro nesta solução. Fico tão feliz em ouvir isso. Ele realmente não vinha dormindo bem. A solução positiva será certa… pode confiar. Grande parte dos pacientes que procura tratamento ortodôntico tem como objetivo principal a melhora da estética, seja dentária ou do perfil, decorrente de uma maloclusão, que resulta de uma interação deficiente entre as estruturas dentárias, esqueléticas e musculares em proporções variáveis. Orientando um planejamento ortodôntico mais adequado para cada paciente. O diagnóstico da maloclusão de Classe II torna-se de vital importância em função do tipo de mecânica e plano de tratamento que devem ser instituídos. Preconiza-se para o tratamento da maloclusão de Classe II, com retrusão mandibular, o tratamento ortopédico realizado por meio do avanço mandibular. A principal vantagem do uso dos aparelhos propulsores mandibulares reside na melhora da estética facial nos pacientes com maloclusão de Classe II. O Aparelho de Protração Mandibular (APM), idealizado por Coelho Filho (1995), permite uma postura mais mesial da mandíbula sem necessidade de maior conscientização e colaboração do paciente, com resultados efetivos no tratamento da maloclusão de Classe II, destacando-se pela sua fácil confecção, baixo custo e rápida instalação.